The Town of Taber has voted to deny a request by an LGBTQ group to fly a Pride flag on a community flag pole — after a Pride flag was destroyed by vandals twice in one week last summer. The Town of Taber has voted to deny a request by an LGBTQ group to fly a Pride flag on a community flag pole. The southern Alberta town released a statement Wednesday saying a motion was passed Jan. 22 stipulating that the flagpole in Confederation Park will no longer be designated as community flagpole. It will be used to fly only the Alberta, Canadian or Town of Taber flag. Groups wishing to fly other flags in the park may do so on temporary poles "or by other means" during events when they have rented the stage or the gazebo in the park, the town's release says. 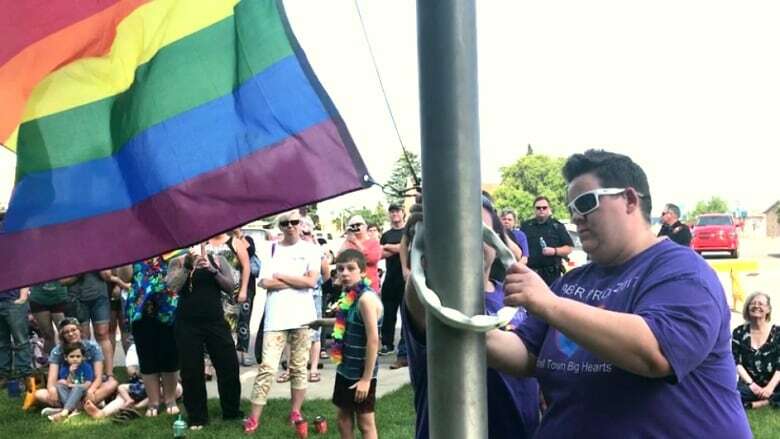 The Taber Equality Alliance was allowed to fly the Pride flag for the first time in the park last summer; however, it was destroyed by vandals twice in one week. On the first occasion, the flag was shredded and tied to tree branches. The town then greased the pole to deter vandals, but someone applied an accelerant to the pole and lit it on fire, destroying the flag. "The Town of Taber encourages any group to fly their respective flags in whatever way they see fit during their events as long as it is done with respect for town property," said Mayor Andrew Prokop. "We look forward to the Taber Pride Celebration occurring in June, and wish the Taber Equality Alliance every success for their event." Kathleen McKenzie, co-chair of the Taber Equality Alliance Society, told CBC News her group isn't giving up yet. "We're not going to sit back and just accept," she said. "We hope to go back to town council, if they'll see us, and try for something that they can agree to." "I'm hoping they're just worried about vandalism again," she added. On its Facebook page, the group said it will "stay strong and resilient in the face of adversity and remember what it is we are trying to achieve. Every day we stand tall to show others the discrimination that still exists in our community." Other critics of the town's decision took to Twitter to denounce council's decision to rule out the Pride flag from flying on the park's flagpole. Kris Wells, professor and director of the Institute for Sexual Minority Studies and Services at the University of Alberta, tweeted that the move "lets hate win out over love." Calgary MLA Sandra Jansen tweeted that if the town won't fly the flag, it would be "an honour" to fly it from Taber's provincial building.